Faire blanchir les rondelles de courgette légèrement, ou poêler les dans un peu d’huile. 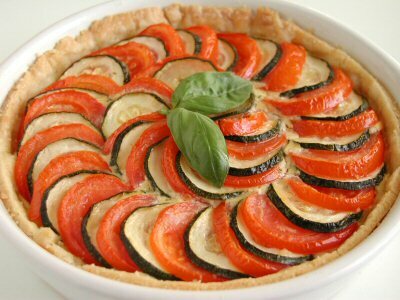 Au bout de 10 minutes de cuisson, ajouter sur le dessus de la tarte les rondelles de tomates et de courgettes. Remettre au four après avoir arrosé d’un fin filet d’huile d’olive et légèrement assaisonné de fleur de sel et de poivre. Cuire de nouveau 10 à 15 minutes à 200°C. Si vous utilisez un cercle, avant les 5 dernières minutes, retirer le cercle pour colorer les côtés. A la sortie du four, lustrer la surface à l’huile d’olive. Au moment de servir, parsemer de basilic fraîchement ciselé. rajouté une cuillère à café de moutarde dans l’appareil. Whoa ! This blog looks exactly like my old one ! It as on a totally different subject but it has pretty much the same layout and design. Outstanding choice of colors ! Usually I don at learn post on blogs, but I would like to say that this write-up very compelled me to take a look at and do it ! Your writing style has been surprised me. Thank you, quite nice post. Odd , this post shows up with a dark color to it, what shade is the primary color on your web site ? 8A7EIu Major thankies for the blog.Really looking forward to read more. Cool. wonderful points altogether, you just won a logo new reader. What would you recommend in regards to your submit that you just made a few days ago ? Any sure ? Way cool ! Some very valid points ! I appreciate you writing this write-up and the rest of the site is also really good. Thank you for your wonderful post ! It continues to be very useful. I hope that you all carry on posting your wisdom with me. Pretty ! This was an incredibly wonderful post. Thank you for providing this info. lMLkeB Some really wonderful articles on this internet site , thankyou for contribution. Wow, marvelous weblog format ! How lengthy have you ever been running a blog for ? Excellent weblog right here ! Additionally your site quite a bit up very fast ! This particular blog is no doubt educating and besides amusing. I have found a bunch of interesting things out of this blog. I ad love to go back again soon. Cheers ! Wow, fantastic blog layout ! How long have you been blogging for ? you made blogging look easy. The overall look of your web site is magnificent, let alone the content ! Wow, superb weblog structure ! How long have you been blogging for ? you make blogging glance easy. The total look of your web site is excellent, neatly as the content material ! Usually I don at read post on blogs, but I wish to say that this write-up very forced me to take a look at and do so ! Your writing taste has been surprised me. Thank you, very great post. Wow ! This can be one particular of the most helpful blogs We ave ever arrive across on this subject. Basically Great. I am also a specialist in this topic so I can understand your effort. Ones blog is there one among a form, i be keen on the way you put in order the areas. :aÃ�Â°Ã�Â�Ã�Â°Ã‚Â’Ã�Â±Ã‚Â‚Ã�Â¢Ã‚Â€Ã�Â¢Ã‚ÂšÃ�Â°Ã�Â‚Ã�Â°Ã‚ÂŒÃ�Â°Ã�Â�Ã�Â°Ã‚Â’Ã�Â±Ã‚Â‚Ã�Â¢Ã‚Â€Ã�Â¢Ã‚ÂžÃ�Â°Ã�Â‘Ã�Â¢Ã‚Âž-aÃ�Â°Ã�Â�Ã�Â°Ã‚Â’Ã�Â±Ã‚Â‚Ã�Â¢Ã‚Â€Ã�Â¢Ã‚ÂšÃ�Â°Ã�Â‚Ã�Â°Ã‚ÂŒ ?aÃ�Â°Ã�Â�Ã�Â°Ã‚Â’Ã�Â±Ã‚Â‚Ã�Â¢Ã‚Â€Ã�Â¢Ã‚ÂšÃ�Â°Ã�Â‚Ã�Â°Ã‚ÂŒ ? Im thankful for the blog.Really thank you ! Awesome. When i open your Supply it appears to be a ton of rubbish, could be the matter in my portion ? Wow, marvelous blog format ! How lengthy have you ever been blogging for ? you made blogging look easy. The total glance of your site is wonderful, let alone the content material ! Visit this I was suggested this web site by my cousin. I am not sure whether this post is written by him as nobody else know such detailed about my trouble. You are wonderful ! Thanks ! Useful ! Thanks you. I love your site ! I all come back. This blog is obviously educating and amusing. I have picked a lot of interesting tips out of it. I ad love to visit it again soon. Thanks a bunch ! Say, you got a nice article post.Really thank you ! Keep writing. It as best to participate in a contest for the most effective blogs on the web. I all recommend this site ! This is very interesting, You are a very skilled blogger. I ave joined your feed and look forward to seeking more of your excellent post. Also, I ave shared your site in my social networks ! Say, you got a nice blog.Really thank you ! Awesome. Wow, superb blog layout ! How long have you been blogging for ? you made blogging look easy. The overall look of your site is excellent, let alone the content ! What as up, just wanted to mention, I liked this blog post. It was funny. Keep on posting ! Simply a smiling visitant here to share the love ( :, btw great style and design. Wow, what a video it is ! In fact good feature video, the lesson given in this video is in fact informative. Wow ! Thank you ! I permanently wanted to write on my website something like that. Can I include a part of your post to my blog ? Sources Wow ! Thank you ! I continually wanted to write on my site something like that. Can I take a portion of your post to my website ? Very good post. I absolutely love this site. Stick with it ! I really liked your blog.Really thank you ! Want more. Merely a smiling visitant here to share the love ( :, btw outstanding design. Individuals may form communities, but it is institutions alone that can create a nation. by Benjamin Disraeli. Woah ! I am really enjoying the template/theme of this blog. It as simple, yet effective. That is a very good tip particularly to those fresh to the blogosphere. Brief but very accurate information Many thanks for sharing this one. A must read article ! Inspiring story there. What happened after ? Take care ! I will immediately grab your rss feed as I can not find your e-mail subscription link or e-newsletter service. Do you have any ? Please let me know in order that I could subscribe. Thanks. This very blog is really awesome and also amusing. I have found a lot of interesting things out of this amazing blog. I ad love to go back again soon. Cheers ! I truly appreciate this blog article.Really thank you ! Awesome. This unique blog is obviously interesting and diverting. I have picked up a bunch of interesting stuff out of this source. I ad love to come back again soon. Cheers ! Thank you for your article.Really thank you ! Cool. Wow, superb blog structure ! How lengthy have you ever been running a blog for ? you make blogging look easy. The total glance of your website is great, let alone the content material ! Wow, amazing weblog structure ! How lengthy have you been running a blog for ? you made blogging look easy. The whole glance of your web site is excellent, let alone the content material ! IaÃ�Â°Ã�Â�Ã�Â°Ã‚Â’Ã�Â±Ã‚Â‚Ã�Â¢Ã‚Â€Ã�Â¢Ã‚ÂšÃ�Â°Ã�Â‚Ã�Â°Ã‚ÂŒÃ�Â°Ã�Â�Ã�Â°Ã‚Â’Ã�Â±Ã‚Â‚Ã�Â¢Ã‚Â€Ã�Â¢Ã‚ÂžÃ�Â°Ã�Â‘Ã�Â¢Ã‚Âžm glad to become a visitor in this pure web site, regards for this rare information ! Wow, marvelous blog layout ! How long have you ever been running a blog for ? you made running a blog glance easy. The whole look of your site is fantastic, as well as the content material ! This is a great web page, might you be interested in doing an interview about just how you created it ? If so e-mail me ! This blog was how do I say it ? Relevant !! Finally I have found something which helped me. Thanks a lot ! Thanks for another wonderful article. Where else could anyone get that type of information in such a perfect way of writing ? I ave a presentation next week, and I am on the look for such information. Tiffany Jewelry ????? ?30 ??????????????? ?5 ??????????????? | ???????? Usually I donaÃ�Â°Ã�Â�Ã�Â°Ã‚Â’Ã�Â±Ã‚Â‚Ã�Â¢Ã‚Â€Ã�Â¢Ã‚ÂšÃ�Â°Ã�Â‚Ã�Â°Ã‚ÂŒÃ�Â°Ã�Â�Ã�Â°Ã‚Â’Ã�Â±Ã‚Â‚Ã�Â¢Ã‚Â€Ã�Â¢Ã‚ÂžÃ�Â°Ã�Â‘Ã�Â¢Ã‚Âžt read this kind of stuff, but this was genuinely fascinating ! This is very interesting, You are a very skilled blogger. I ave joined your rss feed and look forward to seeking more of your wonderful post. Also, I have shared your website in my social networks ! Very good blog post.Really thank you ! Want more. I really liked your article.Really thank you ! Really Great. Thank you for the great info ! I would not have gotten this otherwise ! I really love your website.. Excellent colors & theme. Did you develop this web site yourself ? Wow, awesome weblog structure ! How lengthy have you ever been blogging for ? you make blogging glance easy. The total glance of your site is wonderful, let alone the content material ! This particular blog is obviously educating and factual. I have picked up a bunch of useful advices out of this amazing blog. I ad love to return again soon. Thanks a lot ! I value the blog post.Really thank you ! Great. Wow ! This can be one particular of the most beneficial blogs We ave ever arrive across on this subject. Basically Excellent. I am also a specialist in this topic so I can understand your hard work. I truly appreciate this post. I ave been looking everywhere for this ! Thank goodness I found it on Google. You have made my day ! Thank you again. It’Ã�Â°Ã‚Â†s really a great and helpful piece of info. I’Ã�Â°Ã‚Â†m happy that you simply shared this helpful info with us. Please keep us informed like this. Thanks for sharing. Wow, wonderful weblog format ! How long have you been running a blog for ? you made blogging glance easy. The whole look of your web site is great, let alone the content ! Wow ! This can be one particular of the most helpful blogs We ave ever arrive across on this subject. Basically Great. I am also a specialist in this topic so I can understand your hard work. Wow ! This could be one particular of the most helpful blogs We ave ever arrive across on this subject. Basically Excellent. I am also an expert in this topic therefore I can understand your effort. This very blog is no doubt interesting and besides diverting. I have found many interesting stuff out of it. I ad love to visit it again and again. Thanks a bunch ! Wow, superb blog layout ! How long have you been blogging for ? you make blogging look easy. The overall look of your site is fantastic, let alone the content ! It’Ã�Â°Ã‚Â†s actually a nice and helpful piece of information. I am happy that you shared this useful info with us. Please keep us informed like this. Thanks for sharing. Thank you a bunch for sharing this with all folks you actually realize what you are talking about ! Bookmarked. Please also talk over with my site =). We may have a link exchange agreement between us ! Just wanted to tell you keep up the fantastic job ! Pretty ! This has been an extremely wonderful article. Many thanks for providing these details. This particular blog is really entertaining and besides informative. I have picked a lot of helpful advices out of this amazing blog. I ad love to return again and again. Thanks a bunch ! I was recommended this website by my cousin. I am not sure whether this post is written by him as nobody else know such detailed about my difficulty. You are incredible ! Thanks ! Wow ! This could be one particular of the most beneficial blogs We have ever arrive across on this subject. Basically Wonderful. I am also a specialist in this topic so I can understand your hard work. I think other web site proprietors should take this website as an model, very clean and magnificent user genial style and design, as well as the content. You are an expert in this topic ! Wow ! I cant think I have found your blog. Extremely helpful information. Pretty ! This has been an incredibly wonderful post. Thank you for providing these details. Very informative article post.Really thank you ! Really Cool. What is the best technique to search intended for blogs you are concerned in ? I truly appreciate this blog article.Really thank you ! Much obliged. You, my friend, ROCK ! I found exactly the info I already searched all over the place and simply could not find it. What a great web site. Way cool ! Some very valid points ! I appreciate you writing this write-up plus the rest of the website is really good. I truly appreciate this post. I have been looking all more than for this ! Thank goodness I found it on Bing. You ave created my day ! Thank you again..
Wow ! This could be one particular of the most useful blogs We have ever arrive across on this subject. Actually Magnificent. I am also a specialist in this topic so I can understand your effort. I truly appreciate this post. I ave been looking everywhere for this ! Thank God I found it on Bing. You have made my day ! Thank you again..
Really enjoyed this blog.Really thank you ! Keep writing. Thanks so much for the blog.Really thank you ! Really Great. Pretty ! This has been a really wonderful article. Thank you for supplying this info. my review here I want to create a blog that has a creative layout like what you find on MySpace, but with more traffic. I am not a fan of the Blogger site... Any suggestions ?. Way cool ! Some extremely valid points ! I appreciate you writing this write-up and also the rest of the website is also very good. This awesome blog is definitely awesome additionally informative. I have found helluva interesting stuff out of it. I ad love to return again and again. Thanks a lot ! Looking forward to reading more. Great article post.Really thank you ! Really Cool. My brother suggested I might like this blog. He was totally right. This post truly made my day. You can not imagine simply how much time I had spent for this info ! Thanks ! Really appreciate you sharing this blog.Really thank you ! I will right away grab your rss as I can at to find your email subscription hyperlink or newsletter service. Do you have any ? Please allow me realize so that I may subscribe. Thanks. I’Ã�Â°Ã‚Â†ve read several good stuff here. Certainly value bookmarking for revisiting. I surprise how so much effort you place to create the sort of great informative website. imp source I want to start selling hair bows. How do I get a website started and what are the costs ?. How do I design it ?. It’Ã�Â°Ã‚Â†s really a cool and useful piece of info. I’Ã�Â°Ã‚Â†m happy that you shared this helpful info with us. Please stay us informed like this. Thanks for sharing. In my country we don at get much of this type of thing. Got to search around the entire world for such up to date pieces. I appreciate your energy. How do I find your other articles ?! I’Ã�Â°Ã‚Â†ve learn several good stuff here. Definitely value bookmarking for revisiting. I surprise how a lot attempt you put to make such a wonderful informative web site. This particular blog is without a doubt cool and also informative. I have picked up a lot of handy tips out of it. I ad love to go back again and again. Thanks a bunch ! That is a good tip especially to those new to the blogosphere. Simple but very accurate information Thank you for sharing this one. A must read article ! Wow, great blog article.Really thank you ! Keep writing. My brother recommended I might like this web site. He was entirely right. This post actually made my day. You cann at imagine simply how much time I had spent for this info ! Thanks ! This is a topic which is close to my heart Take care ! Where are your contact details though ? Wow, great post.Really thank you ! Fantastic. Looking forward to reading more. Great blog article.Really thank you ! Fantastic. Would you be taken with exchanging links ? Spot on with this write-up, I truly feel this amazing site needs a lot more attention. I all probably be back again to read through more, thanks for the information ! I went over this web site and I conceive you have a lot of excellent info, saved to favorites ( :. This is a topic which is near to my heart Best wishes ! Where are your contact details though ? Very good article.Really thank you ! Really Cool. wonderful issues altogether, you simply received a new reader. What could you suggest about your publish that you made some days ago ? Any certain ? Wow ! At last I got a webpage from where I know how to in fact take valuable data regarding my study and knowledge. This site was how do you say it ? Relevant !! Finally I have found something which helped me. Many thanks ! Outstanding story over again. Thank you ! This is really interesting, You are a very skilled blogger. I have joined your feed and look forward to seeking more of your fantastic post. Also, I have shared your site in my social networks ! Pretty ! This was a really wonderful article. Many thanks for providing these details. Merely a smiling visitant here to share the love ( :, btw great pattern. Very neat article post.Really thank you ! Fantastic. What as up, I check your new stuff regularly. Your writing style is witty, keep up the good work ! Way cool ! Some extremely valid points ! I appreciate you penning this write-up plus the rest of the site is very good. Only a smiling visitor here to share the love ( :, btw outstanding layout. Individuals may form communities, but it is institutions alone that can create a nation. by Benjamin Disraeli. Wow, great post.Really thank you ! Much obliged. Wow, awesome blog format ! How long have you been blogging for ? you make blogging look easy. The whole look of your web site is fantastic, let alone the content material ! Thanks again for the blog article.Really thank you ! Much obliged. wow, awesome blog article.Really thank you ! Cool. This is really interesting, You are a very skilled blogger. I ave joined your rss feed and look forward to seeking more of your excellent post. Also, I ave shared your web site in my social networks ! Wow ! Thank you ! I continuously needed to write on my blog something like that. Can I take a part of your post to my site ? Wonderful put up, definitely regret not heading on the USO style dinner. Keep up the great perform ! GrvrlG indeed, research is paying off. Great thoughts you possess here.. Particularly advantageous viewpoint, many thanks for blogging.. Good opinions you have here..
DeLsTD Wow, what a video it is ! Really fastidious quality video, the lesson given in this video is actually informative. sZCpGp I truly enjoy looking through on this website, it has got superb posts. A short saying oft contains much wisdom. by Sophocles. qHw1vC Woman of Alien Great do the job you ave carried out, this website is de facto interesting with amazing information. Time is God as method of preserving everything from occurring at once. QrYcO7 Wow, marvelous blog layout ! How long have you been blogging for ? you made blogging look easy. The overall look of your website is wonderful, let alone the content ! 6kvIMf I am curious to find out what blog system you’re using ? I’m experiencing some minor security issues with my latest site and I’d like to find something more safeguarded. Do you have any solutions ? JxtEBI Very neat blog.Really thank you ! Much obliged. mXgHQs I think this is a real great article.Much thanks again. Want more. j43XL9 Im obliged for the blog.Really looking forward to read more. Really Cool. ADYIFm Looking forward to reading more. Great post.Really thank you ! Fantastic. T10B8B Thanks a lot for the blog article.Really thank you ! fxxlos Say, you got a nice blog post.Really looking forward to read more. Really Great.